Three ships with Vietnamese flag related to illegal fishing in Indonesian water, which are KG 90433. ATS 005; KG 94366 TS. ATS 006 and KG 94266 TS. ATS 012, on Friday (5/12) drowned by TNI AL together with Ministry of Maritime and Fishery (KKP) and Bakorkamla, in Anambas water, Riau Islands. 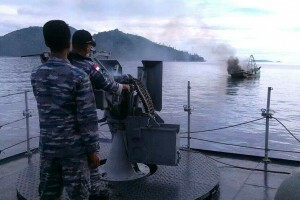 The process starts at 10:20 AM, Bakorkamla with Kapal Negara (KN) together with Kapal Pemerintah (KP) Ketipas and KP Napoleon from KKP with fire did the first fire using machine gun from a distance of 200 meter. President Joko Widodo (Jokowi) instructed all Indonesian National Army (TNI AD) soldiers to help carry out governmental duties, both in municipalities and in regencies, especially to help achieve self-sufficiency in rice in the near future. “I have delivered my messages concerning various matters, including those concerning illegal fishing and drug abuse,” Jokowi said to journalists when he was asked about his directives that he gave in the All-Indonesia Unit Commanders Call 2014 which was centrally organized in Sulung Village, South Arut Sub-district, West Kota Waringin Regency, Central Kalimantan, on Friday (5/12). President Joko Widodo (Jokowi) instructed Menko POLHUKAM Tedjo Edy Purdjianto to sinking three ships which were used to steal fish in Indonesian water, on Saturday (6/12). “Few hours earlier, I instructed Menko POLHUKAM to sinking the ships used by foreigners to steal fish in Indonesian waters on Saturday (6/12)”, Jokowi wrote in his fanpage facebook, uploaded on Thursday (4/12) night. According to the Head of State, the message is that Indonesia is serious in taking firm action towards illegal fishing. “We have to keep our ocean from robbery by outsiders”, he says firmly. On Friday (5/12) morning, President Jokowi continues his message through facebook, that the sovereignty of Indonesian territory includes land, air and oceans. Therefore, in every inch of it is the honor of this nation. 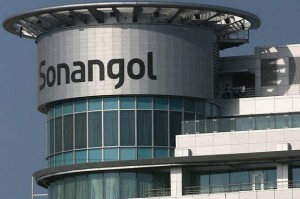 Cabinet Secretary Andi Widjajanto stated that up to now, there hasn’t been any framework yet for concrete cooperation between PT Pertamina (Indonesia’s state-owned oil company) and Sonangol (Angola’s oil company) concerning the plans to import oil from Angola. According to the Cabinet Secretary, in connection with the Government’s efforts to seek for alternative energy sources, the Government is also exploring the possibilities of building government-to-government (G to G) cooperation with Brunei Darussalam, Russia, and Kazakhstan. Government would soon sinking three foreign ships of culprits of illegal fishing in Natuna waters, the Matak island to be precisely, Anambas regency in Riau islands. The execution of these Vietnamese ships would be carried out on President Joko Widodo (Jokowi) instruction. “The message is do not do illegal fishing in Indonesian teritory”, said Coordinating Minister (Menko) of POLHUKAM Tedjo Edy Purdijanto after met the President Jokowi at President’s office, Thursday (4/12). Menko POLHUKAM adds It is government firm action. Minister of Foreign Affairs Retno Lestari Priansari Marsudi said that Indonesian Government kept communicating with Russian Government to rescue Indonesian citizens (WNI) in South Korean Fishing Vessel, Oryong 501, which sank at Bering Strait. “This morning (3/12) Foreign Affairs Ministry held coordinating meeting with related agencies to find out the names of Indonesians, and the evacuation step,” Retno Lestari said prior to Cabinet Meeting at Presidential Office, Jakarta, on Wednesday (3/12). President Joko Widodo (Jokowi) provides direction related to the existence of the ‘boat people’ in a number of areas in the country, some of which are related to acts of illegal fishing. 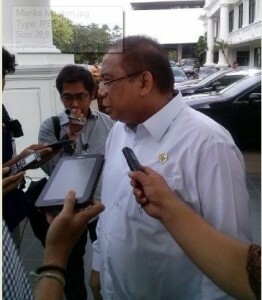 President Jokowi directed that the ‘boat people’ to be repatriated, while the boat captain being face trial, Coordinating Minister for Maritime Affairs, Indroyono Susilo told to reporters after attending the plenary session of the Cabinet, in the office of President, Jakarta, Wednesday (3/12) afternoon. 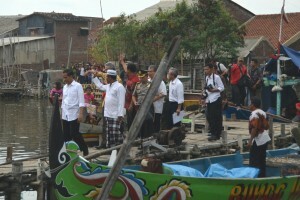 President Joko Widodo (Jokowi) was sad when he visited the widest fisherman village in Semarang, on Tuesday afternoon. “Why don’t our fishermen control the capital? Not being the lord on their own sea, in their own country? Whereas we have the wide sea and a lot of fishes,” Jokowi said it as written in his facebook fan page a few moments ago. According to the President, this illegal fishing has large impacts. One of the impacts is our fishermen are poor now. President Joko Widodo (Jokowi) is scheduled to visit Semarang on Tuesday (2/12) to brief 32 KAPOLDA and 452 KAPOLRES all over Indonesia, at Police Academy. Previously, on Friday (29/11) President Jokowi briefed PANGKOTAMA of TNI all over Indonesia at Garuda room, at Bogor Palace. 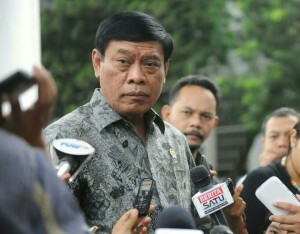 President asks TNI and Police to have regular meeting. In Semarang, President Jokowi would do inspection to Tanjung Emas port and fisherman village Tambak Lorok. “I would take Mr.Jokowi to see condition of Tanjung Emas, Semarang”, said the Governor of Central Java, Ganjar Pranowo, on Monday (1/12). After meeting with the high-ranking officers of Indonesian National Police (Polri) in the Police Academy (Akpol) in Semarang, Central Java, President Joko Widodo (Jokowi) together with Minister of Maritime Affairs and Fisheries Susi Pudjiastuti visited Tambaklorok Fishermen’s Village, Semarang City, on Tuesday afternoon (2/12). 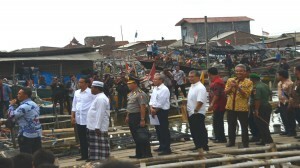 President Jokowi’s arrival immediately excited the residents of the village located in a slum area. They crowded around him and hardly gave him any chance to speak.